Bull-baiting in the 19th century, painted by Samuel Henry Alken. Bull-baiting is a blood sport involving pitting a bull against another animal, usually a dog. In England during the time of Queen Anne, bull-baiting was practised in London at Hockley-in-the-Hole, twice a week – and was also reasonably common in provincial towns. At Tutbury, a bull was tied to an iron stake so that it could move within a radius of about 30 feet. The object of the sport was for the dogs to immobilise the bull. Before the event started, the bull's nose was blown full of pepper to enrage the animal before the baiting. The bull was often placed in a hole in the ground. A variant of bull-baiting was "pinning the bull", where specially-trained dogs would set upon the bull one at a time, a successful attack resulting in the dog fastening his teeth strongly in the bull's snout. The extinct Old English Bulldog was bred especially for this sport. Bull-baiting was not only practised as a form of recreation: there existed a "long-held belief" that baiting improved the flesh. [clarification needed] By the early nineteenth century, the sport began to die out, both because the baiting caused a public nuisance and because of new concerns about animal cruelty. A Bill for the suppression of the practice was introduced into the House of Commons in 1802, but was defeated by thirteen votes. 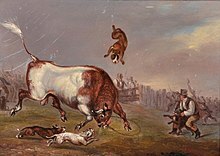 It was not finally outlawed until parliament passed the Cruelty to Animals Act of 1835, which forbade the keeping of any house, pit, or other place for baiting or fighting any bull, bear, dog, or other animal. Bull-baiting (Irish: tarbh-ghríosú) was widespread in Ireland in the 17th–19th centuries. In Dublin, bull-baiting took place near the Cornmarket and in Smithfield. On St Stephen's Day 1789 a riot followed a bull-bait, soldiers fired on the crowd and four were killed. In Wexford, the activity arrived in 1621, brought by the Guild of Butchers; bulls were baited twice a year and their hides presented to the Mayor. The area where bull-baiting took place is still called the Bullring. In Kilkenny it took place at the site called The Ring, first in 1609, and commonly on the feast-day of John the Baptist (December 27). The last recorded bull-bait was in 1837, after they had become illegal under an 1835 Act. Bull-baiting also took place in Waterford, Naas, Drogheda, Tuam, Carrickfergus, Belfast and Athlone. A bull and bear fighting in New Orleans, 1853. In the 19th Century, and during Spanish Colonial Rule, bulls used to be pitted against bears, in California and Mexico. Kingsley (1920) said that the bulls that fought the bears, at least while California was part of the United States, were not domesticated Hereford bulls, but Spanish Fighting Bulls, whose weight, agility, speed, sharp horns and hot temper were said to be dangerous to both bears and humans, and Wistar (1937) said that those bulls were fearless. 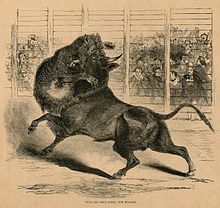 In a case of the bull winning, victory could come early, when the bull used its strength to gore the bear to death with its horns, or toss the bear into the air. Bull baiting dogs, including bulldogs and bull and terriers, were bred to bait animals, mainly bulls and bears. During bull-baiting the dog would attempt to flatten itself to the ground, creeping as close to the bull as possible, then darting out and attempting to bite the bull in the nose or head area. The bull would often be tethered by a collar and rope which was staked into the ground. As the dog darted at the bull, the bull would attempt to catch the dog with his head and horns and throw it into the air. In 1835, the Cruelty to Animals Act was passed in Parliament that outlawed "Blood Sport" in the United Kingdom. The bulldog's work was suddenly over and the bulldog rapidly started dying out. Around 1865 dog fanciers began developing dog clubs which eventually culminated into conformation shows. Many fanciers utilized various remnants of the dog utilized for "Blood Sport" to resurrect the "Bull" dog and ultimately developed today's modern English bulldog. Washington Irving, in his book, The Adventures of Captain Bonneville, wrote that a bear was baited, and likewise, a wild, fierce bull, before they were brought by vaqueros to an arena in a small amphitheatre in Monterey, California, to fight each other. He called the fight "a favorite, though barbarous sport." In this case, he said that the bear used its sharp claws against the nose of the bull, before catching its tongue, after being repeatedly gored by the bull. Then the bull overturned it "with a desperate effort," and then 'dispatched' it rather easily. ^ Griffin, Emma (May 2002). "Sports and Celebrations in English Market Towns, 1660–1750". Historical Research. 75 (188): 200. doi:10.1111/1468-2281.00147. ^ "English–Irish Dictionary (de Bhaldraithe): bull-baiting". www.teanglann.ie. ^ Fennessy, Paul. "So what was sport in Ireland like in the 1600s?". ^ "Bull-baiting in eighteenth century Dublin". 18 May 2016. ^ Rouse, Paul (8 October 2015). "Sport and Ireland: A History". OUP Oxford – via Google Books. ^ Fletcher, Alan John (27 August 2017). "Drama and the Performing Arts in Pre-Cromwellian Ireland: A Repertory of Sources and Documents from the Earliest Times Until C. 1642". Boydell & Brewer – via Google Books. ^ roisin (5 August 2008). "Peter Brennan, ANCA, Pioneer Potter in Kilkenny". ^ "Sketches of Ireland sixty years ago". Jam. MacGlashan. 27 August 2017 – via Google Books. ^ a b Tracy Irwin Storer; Lloyd Pacheco Tevis (1996). California Grizzly. University of California Press. pp. 42–187. ISBN 978-0-520-20520-8. Retrieved 2016-03-23. ^ Brown, David E. (1996). The Grizzly in the Southwest: Documentary of an Extinction. University of Oklahoma Press. Retrieved 2016-03-25. ^ * Jenkins, Robert; Ken Mollett (1997). The Story of the Real Bulldog. Neptune, NJ: TFH Publications. ISBN 0-7938-0491-4. ^ Encyclopedia of Traditional British Rural Sports. Routledge (UK). 2005. ISBN 0-415-35224-X. ^ Fogle, Bruce; Tracy Morgan (2000). The new encyclopedia of the dog. New York: Dorling Kindersley. p. 381. ISBN 0-7894-6130-7. Encyclopedia of Traditional British Rural Sports. Routledge (UK). 2005. ISBN 0-415-35224-X. Griffin, Emma (2005). England's Revelry: A History of Popular Sports and Pastimes. Oxford University Press. Wikimedia Commons has media related to Bull-baiting. Wikisource has the text of a 1911 Encyclopædia Britannica article about Bull-baiting.